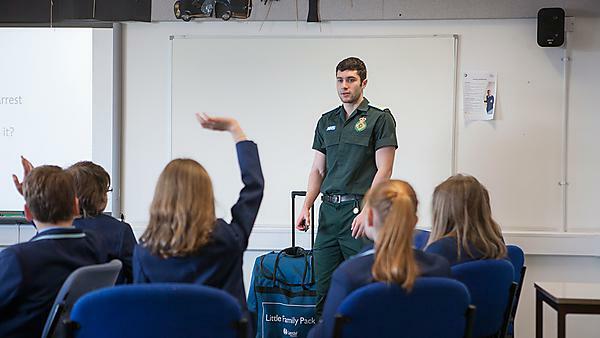 Paramedic students from Plymouth University have designed a programme to teach basic life support (BLS) to secondary school pupils all over the region. The undergraduates are welcoming 250 pupils to the campus this week to teach them how to perform potentially life-saving exercises as part of the BLS Schools Project. The hour-long sessions include hands only CPR and putting a patient in the recovery position. The initiative was the brainchild of paramedic student David Williams, whose own experience has taught him that immediate CPR can save a life. “Experience in my ambulance placements has shown me that bystander CPR performed before an ambulance arrives can be truly lifesaving. However, it is not mandatory that young people learn this vital skill and that is why the BLS in Schools project aims to spread this easy-to-learn skill across the South West. “Studies have continuously shown that when a patient goes into cardiac arrest, their chances of survival decrease by 10 per cent every minute if they don’t receive CPR. The average ambulance response time is eight minutes, so that effectively leaves the patient with a 20 per cent chance of survival if they don’t get help immediately from someone on the scene.